Let’s be honest. 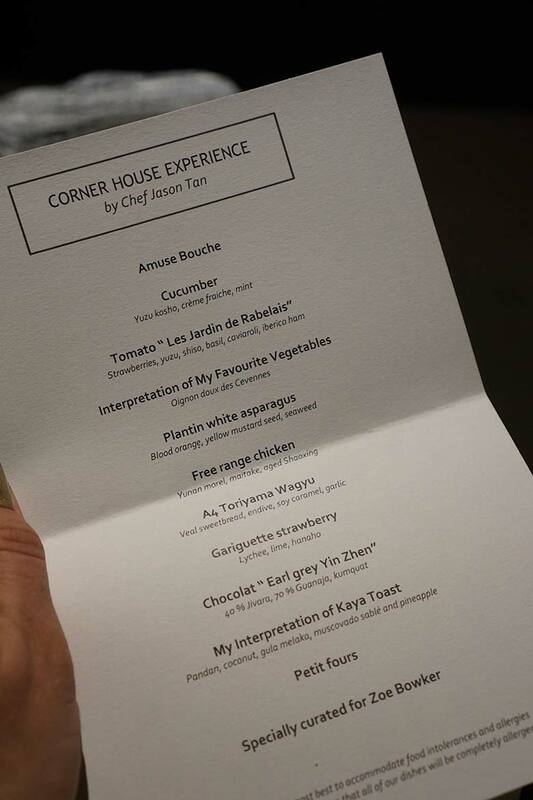 Home-grown Chef Jason Tan is a legend here in Singapore, and I’d be lying if I said I wasn’t excited to see what all the fuss was about. Chef Tan’s Corner House sits nestled in Singapore’s botanical gardens, a spot apparently so romantic that I’ve been depressingly told, ‘It’s so sad you’re going alone’. Alas, such is the food critic life (and to be honest, contrary to public opinion we don’t actually mind dining solo – less complaints about the time it takes to take pictures and the food going cold, plus we can work between courses – something we unfortunately need to do when travelling). 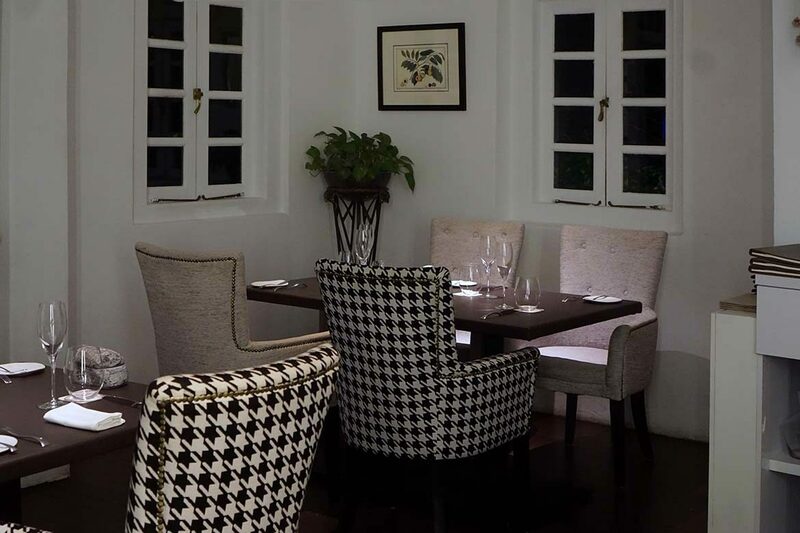 Corner House’s setting is indeed romantic, set in a beautiful two-storeyed heritage building, and I’m seated in an enclosed balcony containing a mere two tables – rather private. Temperature wise, it’s a touch on the arctic side, especially compared to Singapore’s warm and humid climate, but this is quickly remedied by staff – and commendably, while waiting for the frigid air to thaw, a pashmina is rushed to my table to help me brave the chill. 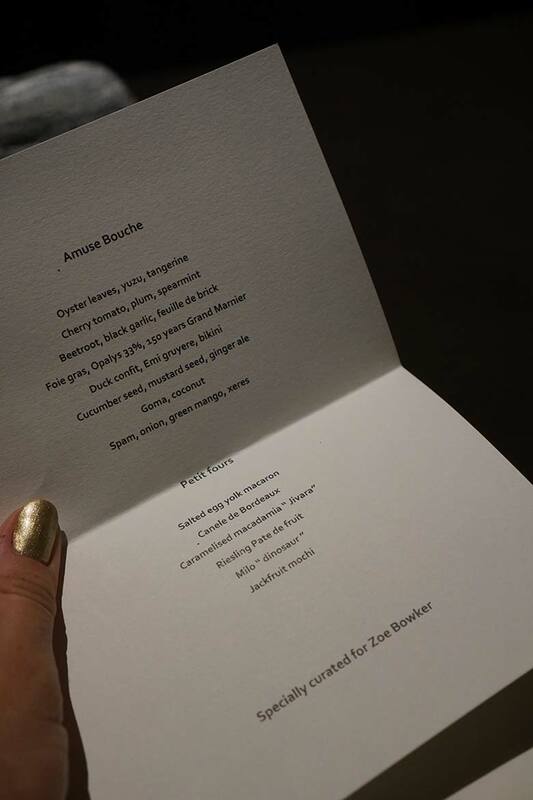 My dinner comes with two menus – one to explain the main tasting menu, and another detailing the snacks and petit fours, of which there are plenty. Nothing makes me happier than a bounty of snacks, so this introduction makes me a very happy (solo) diner indeed. A trio of tiny bites impresses, followed by a petite toasted sandwich of sorts – well, a very fancy one. 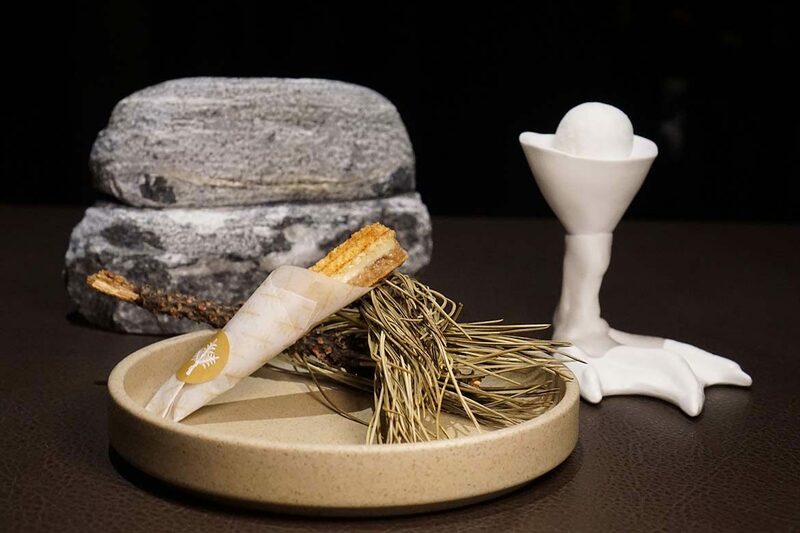 It’s filling consists of duck confit, Emi gruyere and something described as ‘bikini’ – not sure exactly what that is, but it’s certainly not of the swimsuit variety. 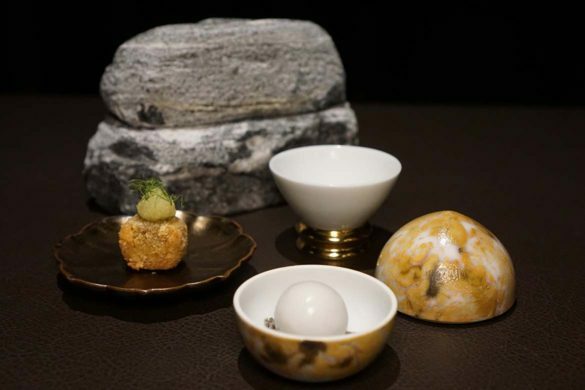 A gelatinous shot of cucumber, mustard seed and ginger ale is as refreshing as it is delicious, and a deep fried cube of spam paired with onion, green mango and xeres is a surprise hit (let’s be honest, spam never sounds glamorous on a menu). 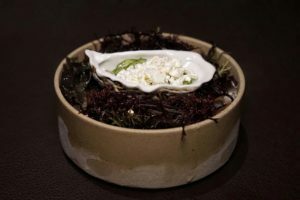 My first course proper, a delicate dish of cucumber accompanied by yuzu kosho, crème fraiche frozen in liquid nitrogen and mint served in an oyster shell, is a winner. It’s apparently the vegetarian alternative to their usual oyster dish, but it’s so good, I say it should go on the main menu. 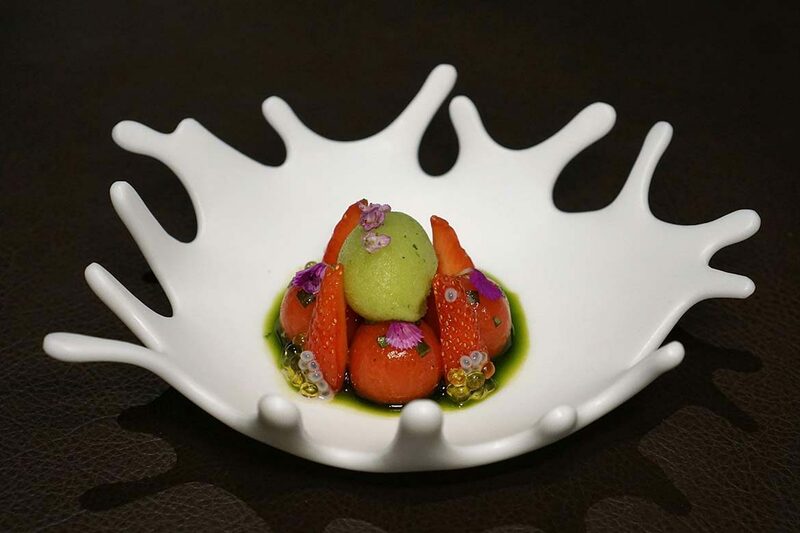 The following plate, “Tomato ‘Les Jardin de Rabelais'”, paired with strawberries, yuzu, shiso, basil, caviaroli and iberico ham also delights the tastebuds, executing the fabulous combination of strawberries and tomato expertly. 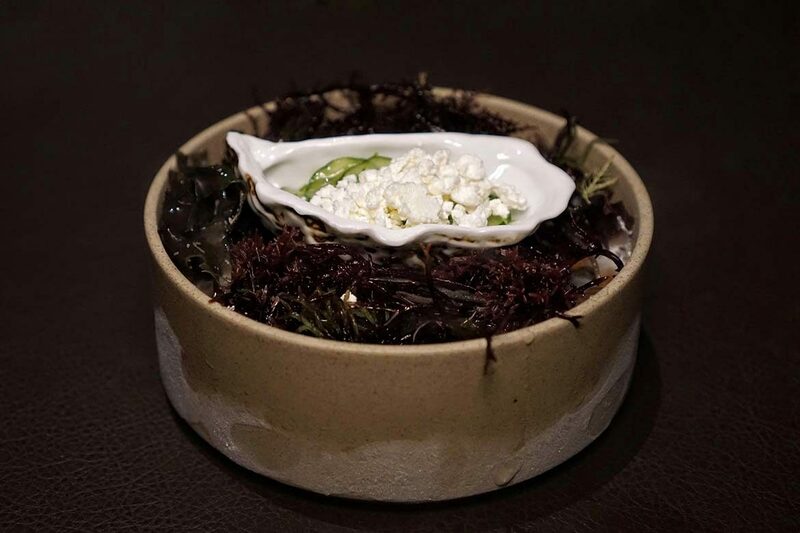 A lovely dish, but of course Corner House’s signature is it’s ‘Interpretation of My Favorite Vegetable’ – that is, four takes on the humble onion. I too, am an onion fan, so revel in all the allium-inspired glory of this course. 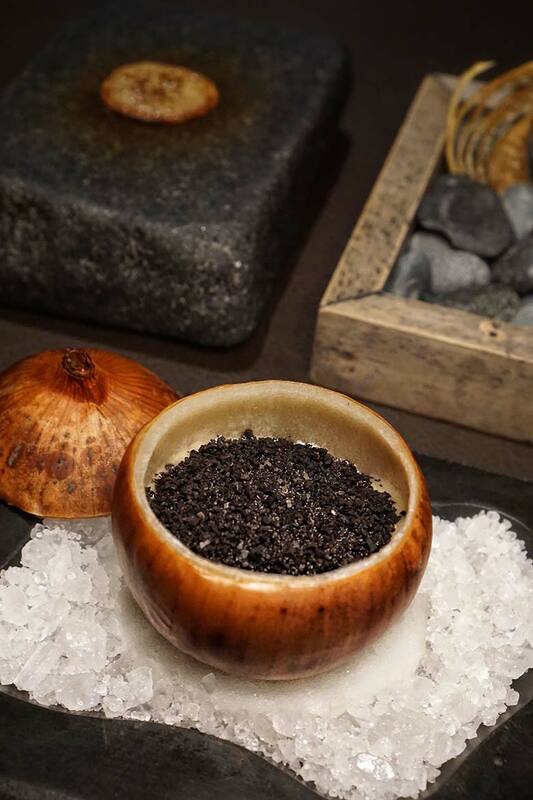 The broth that takes an unfathomable amount of onions to brew (housed inside an onion with a sprinkle of truffle) is spectacular, but the remaining three parts all delight in their own way. A unexpected miss comes in the form of plantin white asparagus paired with blood orange, yellow mustard seed and seaweed; flavours that for my palate, just don’t work together. It seems Singapore’s best restaurants are obsessed with the seasonal asparagus, but this interpretation is probably my least favorite of the many I tried on my Singapore sojourn. Chicken, not often seen in fine dining nor a protein I’d voluntarily choose, is next served alongside Yunan morel (another of Singapore’s current seasonal obsessions) maitake and aged Shaoxing. 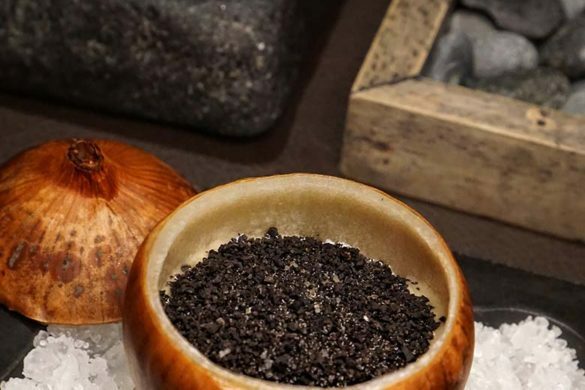 An enjoyable dish, but one that is just crying out for a touch more salt – thankfully Corner House are humble enough to provide a large rock on the table that hides a portion of salt, so diners can adjust to their tastes. Bravo to not assuming everyone enjoys the same level of seasoning. The A4 Toriyama Wagyu is simply beautiful, paired with veal sweetbreads (boy it seems sweetbreads, asparagus and morels are popular in Singapore! ), endive, soy caramel and garlic. It’s a superb dish to signal the end of our savoury section at Corner House, but if I’m honest, I want more! 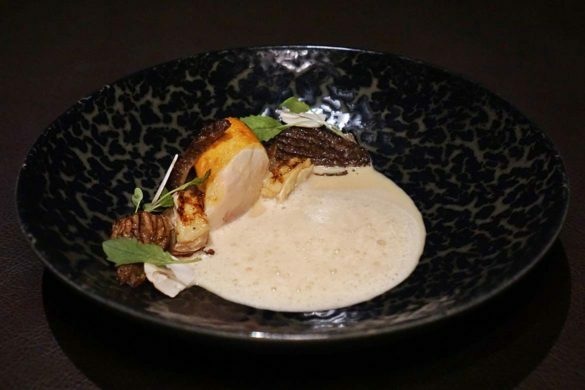 Chef Tan’s food is rather impressive and I’m just not ready to end my journey of discovery, despite my stomach knowing it’s probably time to move on. It’s time for the sweeter side of things, and strawberry makes another appearance alongside lychee, lime and hanaho. Delicious. 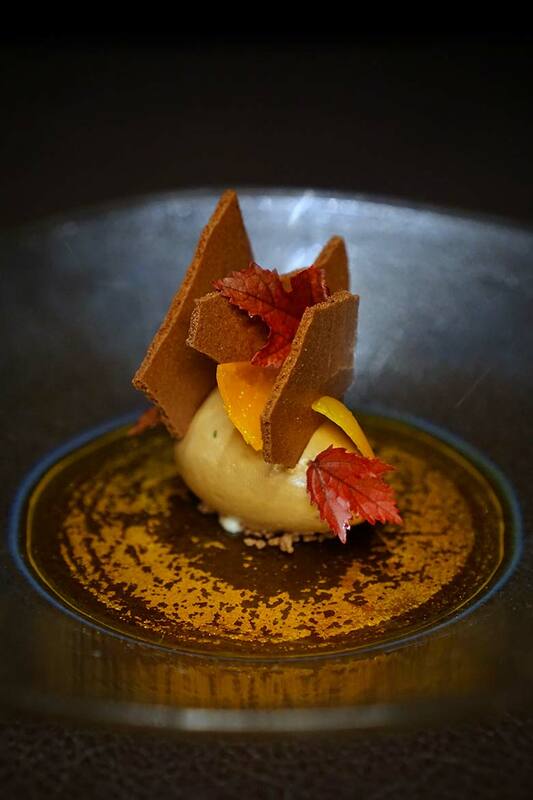 Suddenly I’m feeling slightly less depressed about leaving the main portion of the menu – but if the asparagus course was the fall boy for the savoury roster, then it seems the next, “Chocolat ‘Earl Grey Yin Zhen'” with kumquat is its equivalent on the sweet side. 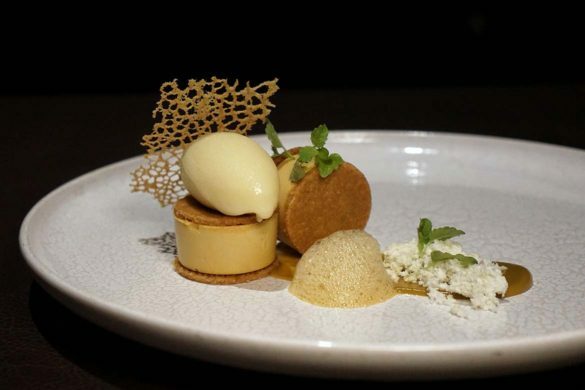 Sadly this dish just doesn’t work for me, lacking enough sweetness to combat the bitter tea notes. Chef Tan comes back in rousing fashion, however, with his interpretation of a local dessert, kaya toast. Combining pandan, coconut, gula melaka, muscovado sablé and pineapple, this is a dish that I couldn’t help but vacuum off the plate. I’m not a dessert fan, but this was just heavenly. A perfect combination of flavours. 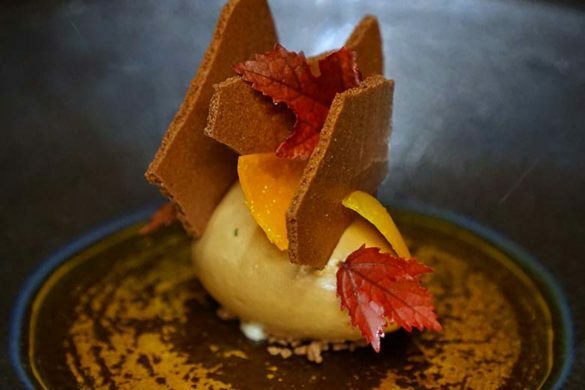 Chef Tan’s talent for integrating local produce into European cuisine is more than pleasant – it’s delicious, and it’s definitely well worth making a special effort to score a reservation at the Singapore institution. 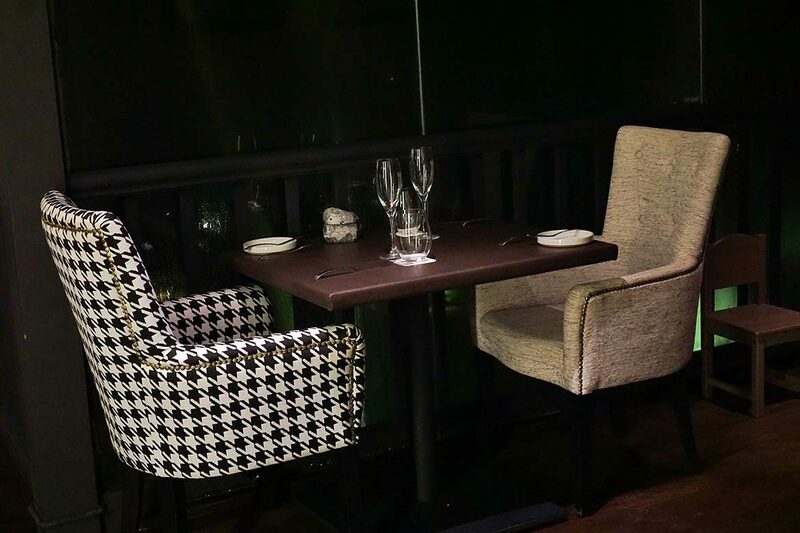 The wine pairings are a success across the board also – I’d definitely recommend going for this option for the optimum Corner House experience. A delightful dinner, and a venue I’d eagerly return to – definitely put this on your Singapore to-do list. Have you dined at Corner House?